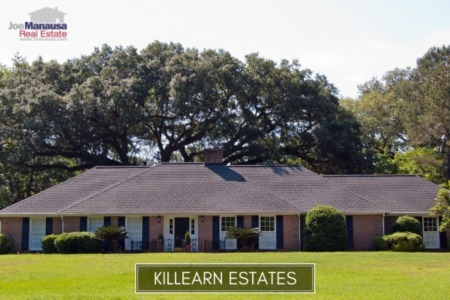 It's hard to believe that June is behind us and it's already time for the Tallahassee Mid Year Housing Report, but the half-way point has been reached. 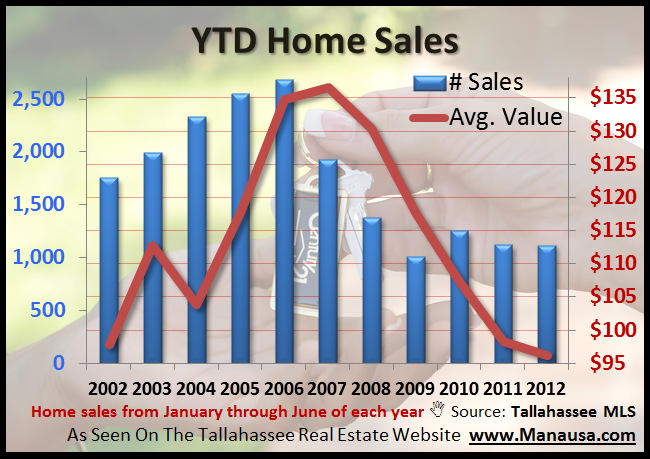 Based upon our normal seasonality statistics, the Tallahassee Mid Year Housing Report (sales from January through June of each year) usually represent 50.2% of the home sales for the year. This makes it a good time to review the first half and to begin forecasting how 2012 will stack up when compared to previous years. The next real estate graph in the Tallahassee Mid Year Housing Report shows that YTD home sales are slightly higher than last year, but average values (price per square foot) have reached an 11 year low. 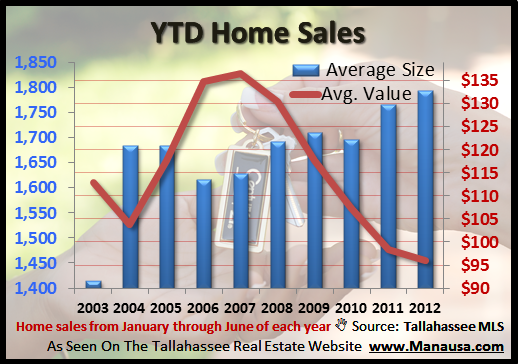 Each year in the graph below shows homes sold in Tallahassee from January through June. 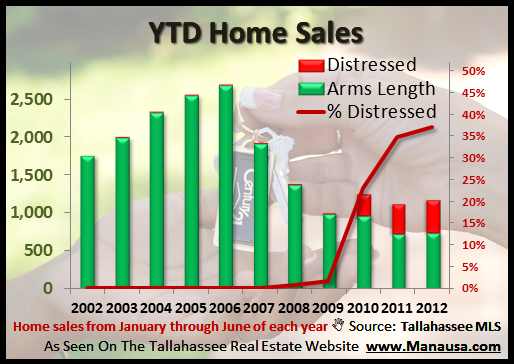 Distressed home sales are on the rise in Tallahassee. Thus far in 2012, 37% of all closings have come from short sales, foreclosures, and bank owned properties. In fact, the slight increase in sales in 2012 is more attributable to distressed property sales than to arms length sales. The rise in distressed properties for sale means that we are not going to see this trend change dramatically any time soon. The final graph in our report shows that as values decline, buyers in the market are scooping up larger homes. 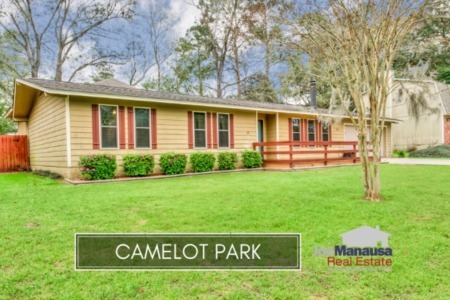 Too often, we see real estate reports that announce the movement in average or median home sales prices, which often times confuses consumers into believing they are looking at information on values. The graph below helps show that when you compare unlike properties over time (apples to oranges), you need to look at values, not prices. Currently, the average home value in Tallahassee is $96 per square foot, a threshold not seen since before 2002. Just using the raw math from our seasonality report, we can project that 2012 will end up 6.4% higher than 2011 with 2,355 closed home sales in the Tallahassee MLS. Of course, 2011 finished very weakly, so assuming this does not happen in 2012, we can hopefully call the market bottom (units sold) behind us. If you happened to read my 2012 Real Estate Forecast that I did in early December of last year, I projected a marginally better year in unit sales and further declining home values of 4% to 8%. The data used in that report was from all sales in Tallahassee (not just homes sold by Realtors in the Tallahassee MLS), but the percentages should still be consistent. I think our report today is in line with my previous forecast, and I see no reason that those numbers should change at all. So my "final answer" for the Tallahassee Mid Year Housing Report Forecast is a modest rise in unit sales and home values declining 4% to 8%.